Sometimes I wonder if what drew me into rationalism was the fact that there is a whole side of my personality that is fanatically devoted to thinking irrationally. In other words, my skepticism has evolved as a kind of internal defense mechanism. On the one hand, I am capable of putting together evidence logically, making correct inferences, and thinking calmly and dispassionately about a wide variety of subjects. On the other, I am simultaneously capable of being a wildly illogical neurotic who misinterprets everything, comes to conclusions that are based in fear and anxiety rather than fact, and if allowed, will run around in circles babbling incoherently in complete freak-out mode. The whole thing comes up because yesterday I had the Medical Procedure For People Over 50 That Must Not Be Named. I was, actually, five years overdue for the MPFPO50TMNBN, because I was heavily invested in pretending that it didn't exist. I have spent the last five years completely convinced that screening and early cancer detection are absolutely critical, and also that the safest bet was to avoid the procedure entirely because if I had it, the doctor would tell me that I had three months to live. But my wife and two friends finally twisted my arm into making an appointment. The result was that I spent three weeks following scheduling my visit in an increasing state of panic. I found myself having thoughts like, "Wow. I wonder if this is the last time I'll hear this song, given that I have a terminal illness?" and "I hope my family will be able to get over their grief and move on quickly." Knowing that these were ridiculous things to think -- I have absolutely zero incidence of cancer in my family, back to all eight great-grandparents, I'm not and have never been a smoker, I exercise regularly and eat right -- made no difference at all. Of course, the closer it got, the worse it got. Two days ago I had to start what is, honestly, the worst phase of the procedure, which is a thing with the innocent name of "prep." "Prep" involves drinking ten glasses full of a liquid that appears to be chilled weasel snot. 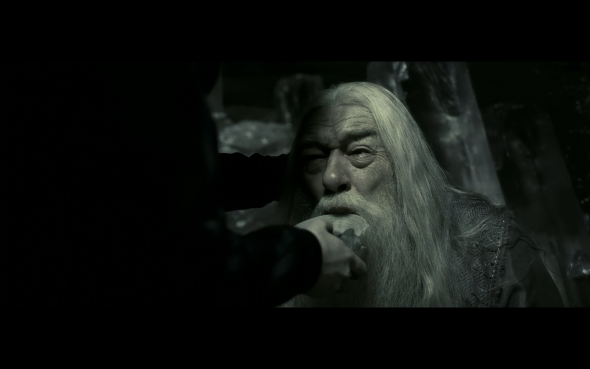 After the second glass, I was reacting a little like Dumbledore did when Harry Potter had to force him to drink all the liquid from the basin so they could get the Horcrux. But the taste is not the worst part. The worst part is that the weasel snot causes a set of symptoms that I will not describe more fully out of respect for the more delicate members of my readership. 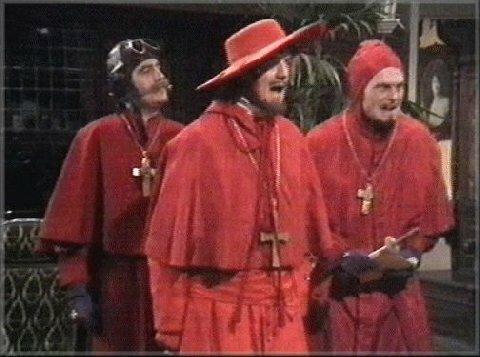 Suffices to say that I have it on good authority that "prep" was ruled out by Tomás de Torquemada as a means for inducing the prisoners of the Spanish Inquisition to confess to heresy, on the basis of its being too unpleasant and humiliating. Anyhow, yesterday morning at 7 AM I was finally done with "prep," and my wife drove me to the hospital for the procedure. I sat in the car watching the trees and houses zoom past, feeling more and more like a condemned prisoner being marched toward the gallows. I knew I was going to be sedated for the procedure, which was something of a relief; but still, the knowledge of what they could potentially find was absolutely terrifying. ... and I proceeded to sleep soundly through the entire procedure. I woke up in the recovery room and was immediately told that the whole thing had gone swimmingly, and that I didn't have to come back for a retest for ten years because I had no sign whatsoever of abnormality. Well, physical abnormality, anyhow. Even in my groggy post-sedative state, I was lying there thinking, "What an incredible goober I am. I spent the last three weeks working myself up into a lather over nothing." Which is absolutely true, but (I can say from hard experience) will not change my behavior one iota next time. My rational brain learns from experience; my irrational brain has exactly the opposite reaction. "Uh-huh," it shouts, flecks of spittle forming in the corners of its mouth, "all this means is that it'll be more likely that you'll be dying next time! Mark my words!" So I suppose, given my split personality, it's no real wonder that when I discovered rationalism during my teenage years, I embraced it wholeheartedly. It seemed like a good way to immunize myself against loopy magical thinking. And it's worked -- at least most of the time. But like some latent parasitic infection, the magical thinking is still there, and all it needs is the proper incentive to come roaring back and screaming my calm logic into stunned silence. In any case, I'm glad my irrational brain was wrong, because not only is it irrational, it's also a dreadful pessimist. Apparently I will live to write Skeptophilia another day. Unless, of course, there's something else I'm dying of that the test didn't catch. Always a possibility, that. In case anyone is in any doubt, I've witnessed the running in circles thing myself. For me, "PREP" = "TRAUMA."